Let's face it. All costume parties have a competitive flair. You might be a Freudian Slip pun guy, you could be the super scary evil scarecrow type, or maybe you're more of a seductive siren kind of gal. Whatever your costume style, dressing up is all about putting your best, or at least most interesting, foot forward. This trophy set is a must for those of you who are holding a good old fashioned costume party. We all love costume parties because you can see your everyday friends and family in a much different light than usual. Not only that, the better the costume, the more in character the person tends to be. So be careful when Paul the mailman turns up in that spine tingling Dracula costume, he might just have a higher predator drive than usual. 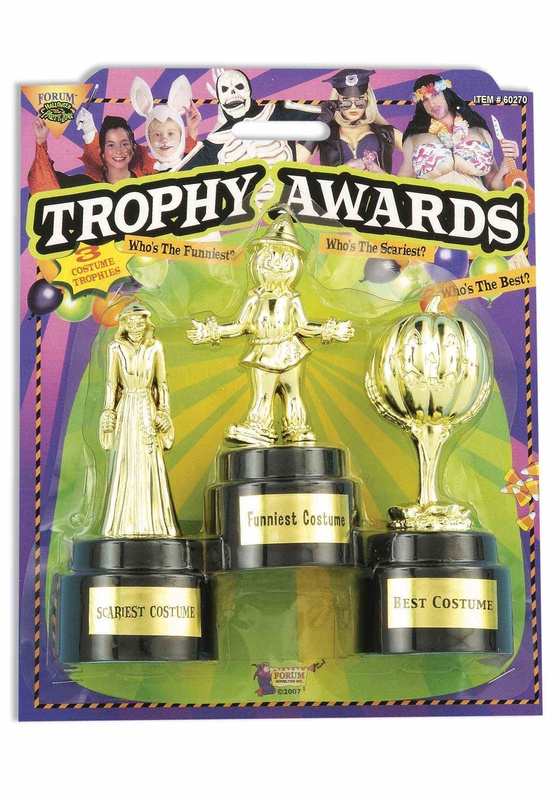 Your guests showed up dressed to the nines, so thank them for their enthusiasm with these three trophies for scariest, funniest, and best. Who knows, maybe Aunt Meg will finally be recognized for her favorite deviled egg costume.